Createspace Independent Publishing Platform, 9781494231705, 256pp. An unusual heroine, Fiona Hawthorn grew up running free. Without a mother to restrain her, she spends her days riding her horse neck or nothing across her father's fields and swimming like a sea nymph. But inside a prim and proper Regency sitting room Fiona is bound to overturn the teapot or accidentally trip the footman. Her notorious Aunt Honore decides to take the hoyden in hand, but amidst the strictures of the Beau Monde, Fiona is a fish out of water. 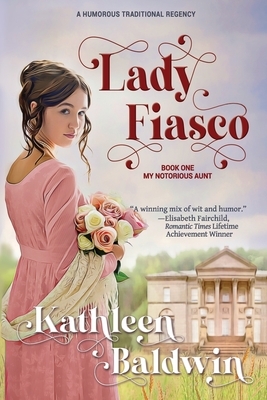 Lady Fiasco is a Sweet Traditional Regency Romance. , p. AUTHORS' NOTE: Lady Fiasco was my very first full length novel. Over the years, I've gotten many letters from readers asking where I got the idea for the story. As with all ideas, it was a fusion of elements. First, I drew from real life. My one and only aunt was as wildly unpredictable and outrageous as Lady Alameda. Maybe worse. One never knew what to expect when she blew into town. It is only natural that her bigger than life personality seeped into my creative id and played havoc there, too. A compulsive history buff, I ran across a book of lampoons by the amazing George Cruikshank making fun of the famous people of the day, including the Prince Regent. I could not resist including one or two lampoons in this book. Political and social lampoons were wildly popular in the Regency era even though the drawings were surprisingly bawdy and scandalous. I also loved reading Georgette Heyer's adventurous Regency Romantic comedies. Georgette Heyer inspired me to leave off writing short stories and tackle a Regency. She opened the door to other writers like; the amazing Julia Quinn, and Marion Chesney with her quirky characters, and the incomparable Elisabeth Fairchild, who later became a close friend. I also fell in love with the early writings of Loretta Chase. Ms Chase wrote some very funny traditional romances before she became famous for her iconic long historical Regency romance, Lord of Scoundrels. It is with deepest respect, that I pay homage to all these great writers and say a hearty thank you for the inspiration. I must also mention Jane Austen, whose dry wit and tongue in cheek humor had a profound effect on my writing as far back as High School. I devoured Jane Austen's writing not long after I was introduced to my beloved Oscar Wilde. A rascally fellow in real life but an amazing literary genius. In college, I studied the humorists: P.G. Wodehouse and O'Henry. Wouldn't it be marvelous to arrange a netherworld tea party and invite Oscar Wilde, Jane Austen, Georgette Heyer, Wodehouse and O'Henry? I'd put on my best frock and sit quietly listening to them shoot barbs at one another. What fun You'd come too, wouldn't you? So there you have it, these few hundred things went into the making of Lady Fiasco. Drop by my website, and let me know what you think of it. English writers have always fascinated Kathleen Baldwin. In eighth grade, she despaired when Mrs. Meyers, her school librarian, explained the school simply did not own any more books by Mr. Dickens. "What? Oh no. There must be more?" Kat moaned. "Come with me." Her wiley librarian had a plan. You see, she and Kat's English teacher, Mrs. Chamberlain, (who excused Kathleen to go to the library every day except test days) had long ago decided their young student was destined to be a writer. Mrs. Meyers cleverly introduced Kathleen to other authors who filled the gap; Jules Verne, Sir Conan Doyle, Tolkien. But when Kat got hold of Jamaica Inn, the fabulous Daphne du Maurier became a new favorite. More delights followed when Oscar Wilde, Jane Austen, and Georgette Heyer taught Kathleen to savor the nuances of English wit and humor.